Nobody wants ants in their home and definitely nobody wants to use foul-smelling, potentially harmful pesticides either. But desperate times call for desperate measures, right? Not quite. Instead of reaching for that bottle of pesticide, you should be reaching instead for something more natural and wholesome. From peppermint oil to good old soap and water, these are five natural ant repellents that are bad for ants but not bad for you. Soap and water – Combine one-fourth cup of dish detergent with one cup of water to create a simple yet effective spray solution. Coating ants with soap will make it impossible for them to breath, and they suffocate as a result. If you see a line of ants marching on your floor or walls, just spray them with this mixture to stop them dead in their tracks. 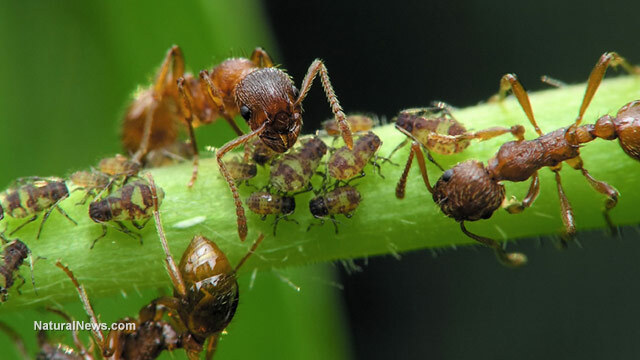 Essential oils: Ants communicate through pheromone trails; when an ant finds food, it secretes a pheromone trail for other ants to pick up and follow. Using powerful-smelling essential oils like peppermint, cinnamon, eucalyptus, and citrus oils will disrupt the pheromone trails. As an added benefit, OffTheGridNews.com notes that citrus oils also contain d-limonene which is a substance that’s toxic to ants. You can opt to swab an ant-filled area with essential oils or spray it to deter ants. Just mix 10 drops of your choice of essential oil with one cup of water and a bit of vodka (which helps prevent the oil and water from separating) then pour into a spray bottle. Spices: Similar to essential oils, the potent aroma of spices make them dangerous to ants. Sprinkle them wherever they’re needed. As for which spices are best to use, you’re free to pick from ground cinnamon, dried mint, cayenne pepper, salt, or garlic powder. White vinegar or lemon juice: If your home is devoid of essential oils or spices, then white vinegar or lemon juice are the next best things. To make a spray, just combine one-part white vinegar or lemon juice with one part water. If you’d rather wipe down the affected areas, you can do so with a cloth. Ants are annoying little bugs to have around your home, but they shouldn’t make you bug out. Simply use any of the natural repellents above to let them know they’re not welcome. You can ant-proof your home even further by sealing off any crevices on the exterior of your house with caulk. Petroleum jelly is another safe method of sealing off tiny holes, and can hold for up to a year. Visit Pesticides.news to find out why you should avoid using pesticides as much as possible. You can also check out GreenLivingNews.com and learn about other ways to maintain a healthy and natural life.